Carla Oleska, right, and Shonda Pettiford. That’s the term she used to describe what participants in the Leadership Institute for Political and Public Impact (LIPPI) come away with beyond the certificate they’re given upon completion of the program. Elaborating, she said LIPPI, created in 2010 by the Women’s Fund of Western Massachusetts, is a year-long program focused on providing participants ages 18 to 60 with the knowledge, skills, courage, and, perhaps most importantly, the confidence necessary to become civic leaders in their communities, impact policy on the local, state, and national levels, and seek and hold on to elected positions. And the LIPPI program is perhaps the most visible example of how the Women’s Fund, which Oleska has served as CEO since 2006, has adjusted and modernized its mission in recent years to reflect changing times. “In the beginning, we used to speak about addressing the needs of women and girls,” she explained, noting that, at the time (the mid-’90s), such needs included programs involving economic self-sufficiency, housing, domestic abuse, sexual abuse, education, and much more. “Today, when we look at this time period, what we say is that this fund builds better communities for everyone in Western Mass. by investing in the lives of women and girls. And there’s a real distinction there. This important change in language and focus, as well as manifestations of it, such as LIPPI, are just some of many reasons why the Women’s Fund has been chosen as one of BusinessWest’s Difference Makers for 2012. Another is the nearly $2 million in grants the fund has awarded since 1998 to groups ranging from the Hampden County Correctional Institute to the Global Women’s History Collaborative; from the Railroad Street Youth Project in Great Barrington to Girls Inc. in Holyoke. But perhaps the biggest reason is the fund’s ability to adapt and evolve to remain relevant and impactful in a constantly changing society. Current Women’s Fund board President Shonda Pettiford calls this “being nimble and responsive,” and she considers it perhaps the fund’s most important character trait. Tracing the history of the Women’s Fund of Western Massachusetts, Oleska said it originates with the Fourth World Conference on Women in Beijing in 1995. More than 60 women from this region were at that conference, highlighted by a speech from Hilary Clinton, who said, “women’s rights are human rights,” noted Oleska, adding that the contingent, while on a bus ride back from touring the Great Wall and inspired by what they heard, discussed options for ways to bring the energy from the conference back to Western Mass. Their answer was to create a Women’s Fund, a component of the Women’s Funding Network, which now boasts more than 160 members, or funds, worldwide. The local fund is now one of three in the Bay State, with the others serving the Boston area and the southeastern region of the Commonwealth. 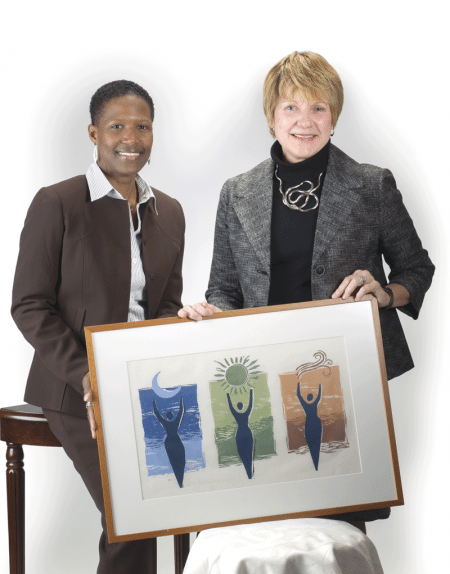 From the start, the mission has been to “advance social-change philanthropy to create economic and social equality for women and girls in Western Mass. through grant-making and strategic initiatives,” said Oleska, adding that the fund deviated from the practice of building up its endowment before supporting any initiatives. “As soon as the money they were raising started earning interest, that first board was determined to get money right out into the communities of the four western counties,” she recalled, adding that the fund topped $1 million in grants after only a decade in existence, and is just one round of awards away from the $2 million threshold. Oleska, who was an early grantee (her organization, Step Forward, an academic-advancement program for girls, was awarded funds in 1998), said the organization is funded primarily by individual donations, the smallest of which has been $3 in change, a bequest she cites often as symbolic of the way the fund can take seemingly small gifts and aggregate them into something significant. “When you take that $3 in change and you connect it with $3,000, the impact of that combined funding presents all kinds of opportunities for our grantee organizations,” she explained, adding that a $10 donation made directly to an organization usually won’t have the same impact as $10 given to the Women’s Fund, which then becomes part of a larger donation to that same organization. But beyond the monetary donation, the grantee also receives a series of professional-development workshops, with the intent of helping them strategically achieve their mission, she continued — to help those organizations work smarter, not harder. And this is one of the many ways in which the Women’s Fund goes well beyond merely writing checks, said Pettiford, and into the broad realm of creating connections. “The Women’s Fund, for me, is very personal — there are many personal relationships formed because of it,” she explained. “The funds we allocate help programs run, and run more effectively. Which brings her back to that word investments and, more specifically, to the LIPPI program, which, in a nutshell, helps women overcome a tendency to underestimate their abilities. It does so through monthly, full-day sessions (staged on Saturdays for convenience) that are designed to build both skills and confidence while exposing women of all ages to successful role models. These sessions focus on subjects ranging from public speaking to effective board participation, from how to speak with elected officials to citizen activism. The results from the first year are impressive. Five of the participants have run for office or are doing so; one woman was elected to the board of her housing development, the first tenant to do so; one woman was accepted into the Yale Women’s Campaign School; and another worked on the campaign of Holyoke’s new mayor, Alex Morse. That’s what comes with a full briefcase of skills. For providing that — and doing much more for women, girls, and communities — the Women’s Fund of Western Massachusetts is truly a Difference Maker.